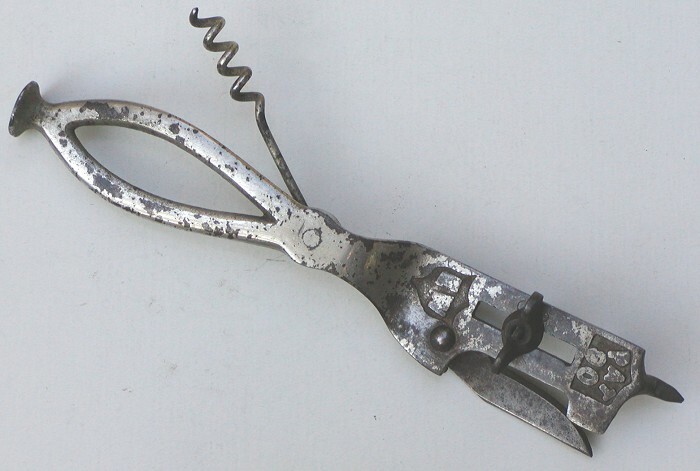 This is an interesting 1890 Wood patent corkscrew and can opener combination tool. This is Elgin Wood's U.S. patent # 434,818 dated August 19, 1890. This example is complete with the adjustbale cutter blade and wing nut. It is marked "PAT 90 EW" on the frame. (Please see pictures for additional details). Good overall condition with no damaged or missing parts. The frame shows some areas of plating loss. Shipping costs will be $5.20 U.S priority mail postage in the U.S. Overseas and Canadian buyers pay actual shipping costs. I do not add charges for packaging, handling etc. Please contact me with your shipping destination if you need a detailed shipping quote. Insurance will if requested will be based on final selling price and quoted at USPS rates. Items are shipped at the buyers risk if insurance is not requested. I accept Paypal, money orders & cashiers checks. Checks and money orders must be payable in U.S dollars and drawn on a U.S. bank.